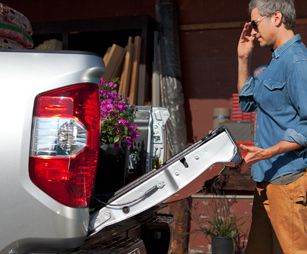 The new 2018 Toyota Tundra was built to be a leader not a follower. Equipped with a potent V8 engine powering your drive combined with the advanced four-wheel drive system, the new Tundra will handle any adventure with ease and control. Slide behind the wheel and you’ll discover a versatile cabin with flexible storage, premium comforts and plenty of smart technologies delivering everything you need to love your time spent on the go. 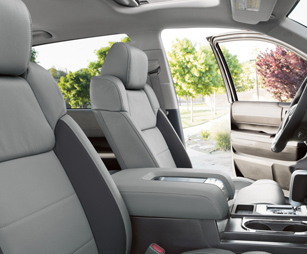 Additionally, thanks to the standard Toyota Safety Sense™ P (TSS-P) protecting you when you need it most, you can command the road with confidence and control everywhere you go. 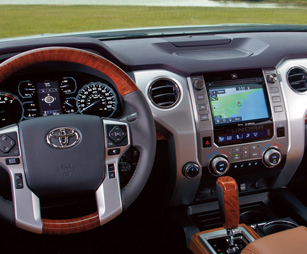 It’s time to let your adventurous soul take the wheel in the new 2018 Tundra. Come experience more for yourself when you test-drive a 2018 Toyota Tundra in Henderson NC, at Henderson Toyota, serving customers from Raleigh and Durham, NC. 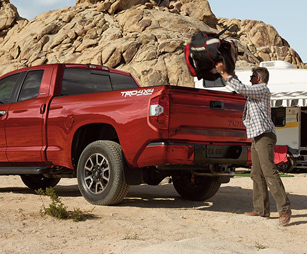 If you’d like to purchase or lease the 2018 Toyota Tundra in Henderson, NC, stop by Henderson Toyota at205 Toyota Lane, Henderson, NC 27537 for a test-drive today. We look forward to serving our customers from Raleigh and Durham, NC.